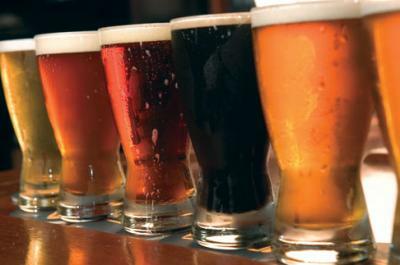 Let me begin with a bold statement: Beer is the most diverse beverage on Earth. While that sinks in, did you know that there are dozens of different styles of beer and countless diversions on styles? You might think this is nonsense, and that beer is yellow, fizzy, and mostly all tastes the same. If this is your perception of beer then sit back and let me fill your glass. Imagine if all you ever knew about food was McDonald's, Wendy's, and Burger King. You'd be missing out on the vast majority of tastes and sensations that make dining so extraordinary. The world of beer extends far beyond Bud, Miller, and Coors, and can take you to gastronomical heights that escape even the most creative imaginations. I guess the most obvious question is, "What is Beer?" As wine is fermented fruit and mead is fermented honey, beer quite simply is fermented grain, with barley being most notable. The process of brewing beer is sophisticated in contrast to the process of making wine. There are more ingredients and more processes involved, which all must be fine-tuned. Beer consists of four main ingredients: grain (fifty percent barley in accordance with most countries legal requirements); water (to facilitate the conversion of starches to sugars); hops (as a preservative and to balance sweetness); and yeast (to ferment sugars into ethanol). Ingredients can also include herbs, fruits, spices, and oddball things like garlic and jalapenos. First, barley is soaked, germinated, and kiln-dried to varying degrees of color and flavor, a process known as malting. The flavors garnered range from dry cereals to biscuity, nutty flavors from caramel notes to dry roasted coffee. Next, the malted barley is mixed with hot water, causing enzymes to convert starches into fermentable sugars. The sweet liquid derived is called "wort," which is then transferred to a kettle. The wort will be boiled approximately an hour to an hour and a half, at which point hops or other herbs, fruits, and spices are added. Afterwards, the wort is cooled and transferred to a fermenter, where yeast is added. Depending on the strain of yeast, it will ferment for two weeks to one month, at which point it will be filtered, carbonated, bottled, and kegged. When appreciating a beer, one should know the proper care and techniques to maximize the experience. First and foremost is glassware. There are styles of glasses that correspond with and accentuate styles of beer. Never drink beer out of a bottle, even if your only option is an ordinary pint glass. When pouring, keep your glass at a forty-five degree angle until halfway, and then pour straight down the middle creating a one-inch head. This release of carbon dioxide is the perfect time to experience the aroma. Do you smell bananas, caramel toffee, or possibly citrusy grapefruit? Whatever it is, take it in. The aromatic compounds in beer will fade fairly quickly. Take a step back and enjoy the color and head. Is it a beautiful thing to behold, or is it flat and uninspiring? Now tip the glass to your lips. Breathe in with your nose as you sip to kick start the flavor sensations. Do you taste malty sweetness, dry roastiness? Maybe it's exceedingly bitter with floral and citrus notes? Also note how the beer coats your mouth. This is referred to as body and mouthfeel. If it's higher in alcohol content, it may finish with a pleasant warming sensation. At the complete of sensory evaluation, ask yourself how it was overall. Have you discovered a new favorite?